Sally came back for a visit last night. It must be spring. I heard spring peepers for the first time tonight. "Your mother was really special -- she was intelligent, but I've known other intelligent people. She was kind. I've known others who were kind. She was a hard worker. So are others. She was wise and understanding - as are some others. But Dorothy was all of these. She was truly one of the nicest and most interesting women I've known." 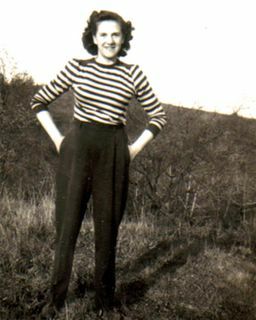 Mom in 1945. 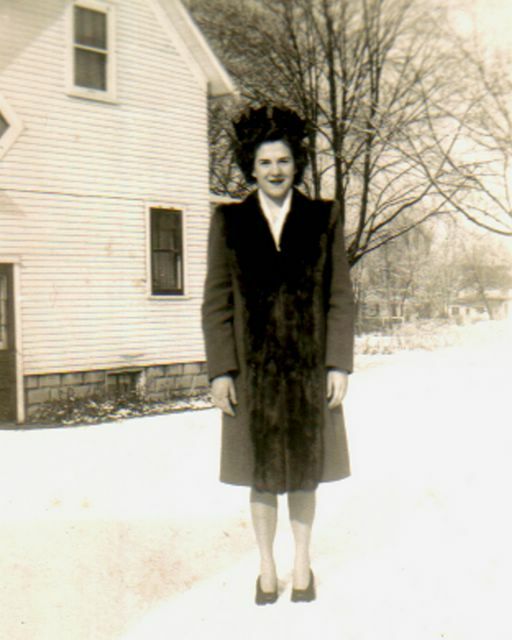 She saved her working girl wages for a year to buy this coat and then hems dropped after the war. Note the legs! Even as she lay in the hospital bed this week, looking at her legs and feet made you think of a 15 year old girl...especially with the pink polish on her toenails. Always a lady. I'm working on a photo display of Mom for tomorrow's Gathering of Family and Friends. I thought I would share the two photos I'm enlarging for the display. This is Mom in 1944, age 21. Her children shall rise up and call her blessed. She took a turn for the worse yesterday morning. She has sepsis on top of her valve problems and struggled for survival all day yesterday. The final culture is not back yet so they started her on broad spectrum antibiotics. Mid afternoon they started her on another drug , Xigris by Eli Lily, which helps prevent the deterioration of organs due to sepsis (according to my understanding). The doctors are holding out little hope and the grandchildren are coming home from out of town. But we are still clinging to hope. Besides, they don't know my mother. Mom's in Coronary ICU so posting has been light and will continue to be light. From shoulder pain to flu to major cardiac event within two days, despite visits to the ER on Wednesday, cardiologist on Thursday and family physician on Friday. As soon as the underlying infection is clear, she will have mitral valve replacement surgery, but first they have to stabilize her. Thanks for the prayers I know will be raised for her quick recovery. Now back to the hospital. This is such a hoot because I am slightly more than twice that age. As I answered the questions, I thought that I would be in the 40+ category. I guess the fact that I would "run around outdoors" is in the under 12 category which balanced out the 40+ answers. 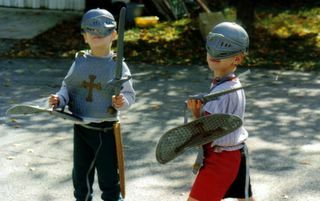 Three of the blogs I just read mentioned children playing knights. Jordana at Curmudgeonry, Terry at Possumblog (post titled Yet Another Weekend) and Tulip Girl. 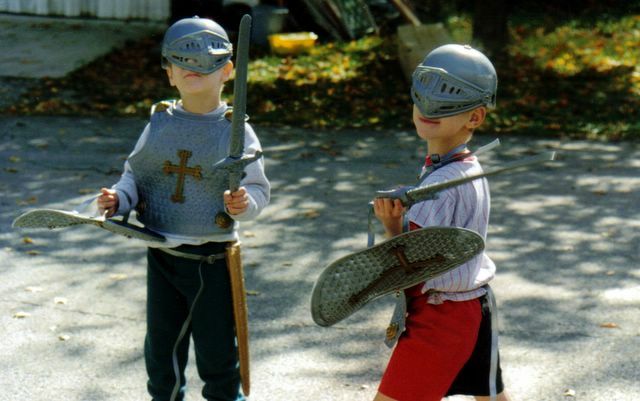 Here are my Young Knights in the Fall of 1996. No longer do they pick up the physical sword and shield but they are looking for damsels to rescue. The first crocus bloomed today - an early species crocus, not the GIANT crocus. The yellow bloom must have been giving off a lot of heat because it melted through four inches of snow to shine its face to the sun. I am writing this in such a way to protect my son's privacy. Son asked me to take him to the library. He headed to the poetry section and found a book of love poems so he could write a love note to someone he is sweet on. Then he handed me the book and made me carry it so no one would see him with a book of love poetry! In the sky the moon set flames of light to stars? 1.) Have you traveled anywhere by boat (across a pond or around the ocean)? 2.) Have you ever owned a boat? Well, right now we have 6 canoes, 1 jon boat and 1 paddlewheel boat. 3.) If you were to take a boat trip and had unlimited funds and no motion sickness, where would you go, who would you take and what kind of boat would you go on? I'd take only my husband. We dream about two trips in our canoes. The first trip starts on the Eel River (a few miles from our house) which empties into the Wabash River, which empties into the Ohio which empties into the Mississippi, then down Ol' Man River to New Orleans. That's a realistic dream, but with unlimited funds (and time), I'd extend our paddle through Central and South America. I'd have to get a map to determine our route. The other trip we dream about is on Nahinni inspired by Dangerous River. We located several outfitters who will take us down the river but the cost is too high. Donations accepted! Bonus question: What food stuffs would you want if you were marooned. Terry had the right idea with MREs. We took them on the mule trip into Three Sisters Wilderness area and survived very nicely. I'd also include "Icing on the Cake" coffee beans. You scored 100% Beginner, 100% Intermediate, 93% Advanced, and 66% Expert! each of these three levels' questions correct. This is an exceptional score. Remember, these are commonly confused English words, which means most people don't use them properly. You got an extremely respectable score. Take the test and let me know how you did in my comments section. I'm expecting the females in my extended family will show me up! Last summer I froze a lot of fruit - blackberries, blueberries, cherries, apples and grape juice. The apples are gone. "Mmmm, I never knew applesauce could taste so good," was the family's response. Only a few jars of grape juice are left. The blackberries are getting low, but I'm the only one who eats them (in yoghurt). About half of the blueberries are left, so blueberry pancakes will be on the menu soon. A lot of the cherries are left, so a pie is in the oven and I'm making cherry preserves right now too. 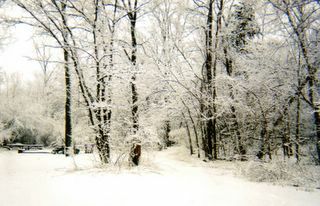 This is the open area at the bottom of the lane. The fire pit and picnic tables are on the left and the river is to the left of it. We use the open area for camping, ball games and the infamous Monster Tag. 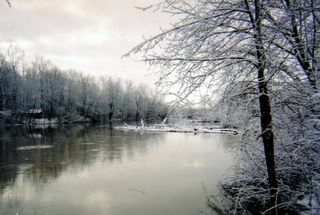 This is the St. Joseph River, where we ply our paddleboat, when the snow and ice are gone. We are monitoring the creation of a new island in the middle of the river, starting with a log jam, next came several wetland plants and now we are seeing small sycamores and other wetland trees, meanwhile soil is accumulating. This is the Boys Club. One end of the building is insulated and heated and furnished with a desk, chairs, lamps plus secret boy stuff. 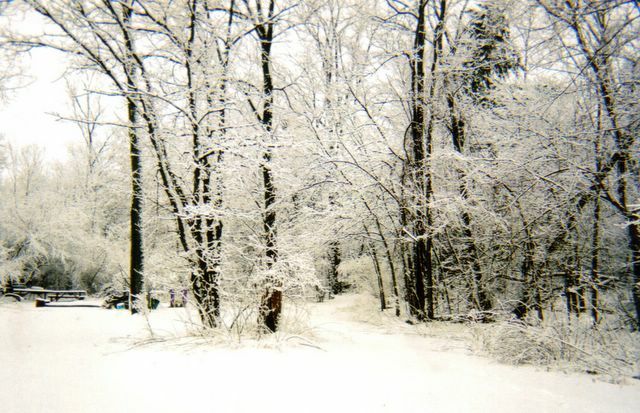 The lane to the right goes down to the river. With sunny skies and high temps, I spent a few hours at the Highlands pruning the trees. In the time it took me to prune five rows the last time, I only got one row finished Sunday. There were more hardwood trees, more brambles and a few larger trees with difficult cuts. I was going to go back today, but it rained, got cold and I had errands. I followed a link and discovered that the Highlands is located in the 25th most desirable rural county in the US of A, according to Progressive Farmer. Now this surprised me somewhat as there are definite reasons why we did not build on this land - school systems, racial intolerance, unkempt homesteads. Although DeKalb County has some upscale places and is the home of the Auburn-Cord-Duesenberg Museum and one of the world's largest antique auto auctions. Last Saturday our school hosted 27 choirs in an invitational. A lot of work for everyone but Ricky was in his element. He took seriously his job as room host for one choir, staying late on Friday decorating the room. Then back on Saturday at 6 am. At one point I saw him slither under the stage in his black tuxedo and patent leather shoes, shirt hanging out, to unfasten something. I groaned. Mid-afternoon his choir performed an exhibition show and Ricky seemed to dance with more energy than any of the other boys. Then he was the only choir kid who stayed late to tear down the stage. It was interesting to watch the men work with Ricky and their looks of approval at his hustle. At 12:30 I insisted he come home with me. As we headed for the car, he said, "You were right, Mom. I'm exhausted." He slept until noon. When he got up, he said, "I can't wait for next year's invitational!" Santa brought the boys a Casting Crowns CD and they especially like the song, "American Dream." On the way home from the concert I asked Ron if he felt I did not go to enough of his games when I was working full-time. "No, Dad was there. After all, that's what Dads do." I don't think he can even fathom a father not involved in his life and he doesn't understand how blessed he is. Update: Ricky just asked me to change this post. Santa did not bring the CD. Ricky bought it. Some things are more important to 15 year olds than us old fogeys. Last Thursday, the boys and I saw Casting Crowns, Chris Tomlin and Stephen Curtis Chapman. Ricky, my son in show choir, sat on my left and Ron was on my right. (Yes, a parent still has to separate them sometimes.) Chris Tomlin, especially, encouraged the crowd to stand, sing, dance which Ricky and I did with abandon while Ron hissed at us to sit down and be quiet. Meanwhile Ron was pointing out to me specifics about camera placements, speaker size and the complexity of the sound boards. Stephen Curtis Chapman shared how adopting three Chinese girls changed their lives and related it to God adopting us. Being tremendously moved, I put my arms around my adopted twins in an outpouring of love and thanksgiving. Ron reacted as if he had been burned, shrugging off my touch with a Mom-we're-in-public reaction. Ricky leaned into my hug and put his head on my shoulder. Sometimes it's hard to believe they are twins. 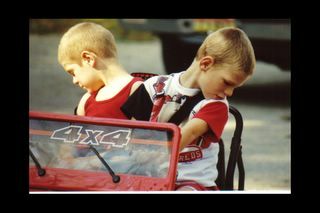 I scanned this photo (circa 1996) for the friend who gave the boys the motorized Jeep. The twins are taking Drivers Ed this summer and I hope they learn to keep their eyes on the road. It's just so fascinating to watch the ground whiz by at high speeds. Ron is launching a full scale attack with the objective of acquiring a Charger from an older teen in the neighborhood. It is black, with a do-it-yourself paint job from a can. It has a chrome spoiler, so it must go fast. It has a loud muffler. All it needs, according to Ron, is a good stereo with the subwoofers in the trunk and poweful speakers in the back seat. Lord have mercy on us. Ron and Rick, age 6, almost ready (just straighten those bowties, Mom!) 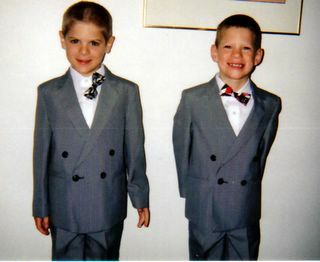 to appear in court to finalize their adoption. I discovered how to post photos using Hello and Blogger! 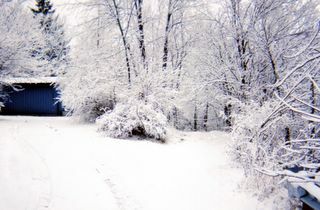 Now I need to get my camera out and perhaps you will be treated to emerging spring around our house. We're clearing out some scrub trees and I just noticed the fat buds of the dogwood.